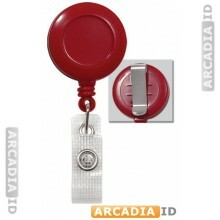 Badge reels provide a great tool for carrying your ID badge. 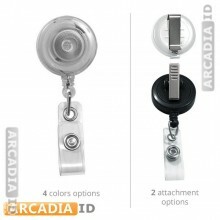 There are several different styles and colors of badge reels available from which to choose. The most common shape for a badge reel is a circle. There are also square and rectangular badge reels available. Another option is a specialty heart shaped badge reel with the pink breast cancer awareness ribbon on it. There are several color choices available as well. Some of the available colors include red, black, white, clear, and pink. Each of the badge reels will attach to the ID using a clear vinyl attachment with a snap. The vinyl piece will go through the badge that has a hole punched in it. The base piece of the lanyard can attach easily to your clothing. There are several options for attachment pieces available including a slide belt clip, a swivel belt clip, swivel spring clip, and a regular belt clip. The swivel clips allow the badge reel to move freely on the access, making it easy to pull the card in and out. The no twist clip will remain straight and keep the cord from becoming knotted or stuck.